Returning to the network where he emerged as a major star more than 30 years ago, Michael J. Fox is the big ticket item on a new NBC prime-time lineup laden with fellow familiar TV faces. Fourth in total viewers and No. 3 among advertiser-prized 18-to-49-year-olds, the Peacock is adding three new comedies and a like number of dramas this fall while saving 11 more series for later debuts. Besides Fox, autumn includes new vehicles for Sean Hayes, James Spader, Blair Underwood and Jonathan Rhys Meyers. In late night news, NBC also announced, as expected, that Saturday Night Live mainstay Seth Meyers will take over for Jimmy Fallon early next year when Fallon replaces Jay Leno as host of the still No. 1 Tonight Show. NBC had surged to the top last fall among 18-to-49-year-olds, largely on the strength of Sunday Night Football and The Voice. But without the NFL and during an extended layoff for The Voice, the network plunged into a ratings free fall. The four comedies NBC introduced last fall -- Go On, The New Normal, Guys with Kids and Animal Practice -- have all been canceled. Other casualties include Whitney, Up All Night, Rock Center with Brian Williams, 30 Rock, 1600 Penn, Deception, Do No Harm, Smash, Ready For Love, Fashion Star and The Office, which as previously announced will end its long run with a Thursday, May 16th finale. The fates of Donald Trump’s Celebrity Apprentice and Hannibal will be announced in “the next few weeks,” NBC says. Community, although renewed for a fifth season, does not yet have a spot on either NBC’s fall or midseason schedule. Only two of the current season’s freshmen series, Revolution and Chicago Fire, are officially graduating to sophomore years. 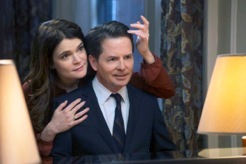 Thursdays, not that long ago an impregnable stronghold for NBC, will house all three new fall comedies, a transplanted Parenthood and returnee Parks and Recreation in the leadoff spot. The Michael J. Fox Show (comedy) -- Fox’s Family Ties, launched in fall 1982, became a Thursday night powerhouse for NBC after being slotted behind The Cosby Show two seasons later. Now he’s back on that night as New York news anchor Mike Henry, who had left the business for five years to spend more time with his family while undergoing treatment for Parkinson’s Disease (which Fox has in real life). The boss who coaxes him back onto the air is played by Wendell Pierce of Treme and The Wire. Sean Saves the World (comedy) -- Sean Hayes, who also came to fame on Thursdays as the scene-stealing second banana on Will & Grace, will be back in those surroundings as the Fox show’s lead-in. He plays a divorced gay dad whose teen daughter moves in with him and gives the old topsy turvy to both his personal and professional life. The requisite “pushy” mom is played by Linda Lavin of Alice fame. Welcome to the Family (comedy) -- It’s a cross-cultural collision course when the parents of a budding college student learn she’s pregnant. The teen father, who’s Hispanic, gets this news via a text message while delivering his high school’s valedictorian speech. “What follows is a crash course in cultural blending,” says NBC. Stars include Mike O’Malley (Glee), Richard Chavira (Desperate Housewives) and Mary McComack (In Plain Sight). Ironside (drama) -- Having struck out with recent “re-imagined” re-dos of Knight Rider and Bionic Woman, NBC takes another shot with an update of this old Raymond Burr crime-stopper. Blair Underwood (L.A. Law, In Treatment) is tough guy Robert Ironside, whose wheelchair won’t stop him from solving New York’s “most difficult and notorious crimes.” He has help from a “handpicked team of specialists” who’d better “stay on their toes.” Because that’s the way gruff, demanding Ironside rolls. Dracula (drama) -- Jonathan Rhys Meyers, who had a distinctive run as Henry VIII on Showtime’s The Tudors, is the latest to have a go at the world’s most famous fictional blood-sucker. 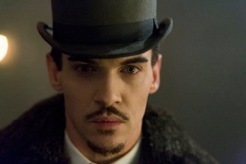 The series is set in late 19th century London, with Dracula posing as an American entrepreneur intent on introducing modern science to Victorian society. He sill can’t withstand the sun, though. The Blacklist (drama) -- James Spader (Boston Legal, The Office) is quickly back in business as the star of NBC’s answer to Homeland. He plays “Concierge of Crime” Raymond “Red” Reddington, a former government agent turned fugitive who offers to help apprehend the world’s most-wanted terrorist. Just one catch: he’ll only collaborate with FBI newcomer Elizabeth “Liz” Keen (Megan Boone). Hmm, what’s his real game? And might she have some deep, dark secrets of her own? Hoping to capitalize on the “promotional platform” provided by the Winter Olympics, NBC plans to launch six more new series in midseason. Since schedules are subject to change -- and most definitely will -- we’ll just give you the rundowns of the Peacock’s post-Olympics half-dozen. About A Boy (comedy) -- Drawn from the Nick Hornby novel and the 2002 Hugh Grant movie, it stars David Walton (Bent) as man-child Will Freeman, who’s independently wealthy after writing a big hit song. But then a single mom named Fiona (Minnie Driver) moves next door with her “oddly charming” 11-year-old son Marcus (Benjamin Stockham). Complications ensue. The Family Guide (comedy) -- J.K. Simmons (instantly rebounding from ABC’s almost instantly canceled Family Tools) plays a soon-to-be-divorced blind man whose wife, Joyce (Parker Posey), is a free spirit who smokes a pipe. Jason Bateman also stars, off-camera, as the adult narrative voice of their 11-year-old son, Henry (Eli Baker). Crossbones (drama) -- Avast mateys, it’s 1715 on the Bahamian island of New Providence, where the sinister pirate Blackbeard (John Malkovich) rules over a “rogue nation of thieves, outlaws and miscreant sailors.” An assassin is hired to take him out, but that turns out to be not so easy. Believe (drama) -- An orphaned girl named Bo (Johnny Sequoyah) is raised by a small group known as the “True Believers.” Therefore she can levitate, control nature and even make uncanny predictions. Co-stars include Kyle MacLachlan and Delroy Lindo. Crisis (drama) -- The children of D.C.’s elite are on a field trip when their bus is hijacked by a “vengeful mastermind.” So how far will their powerful parents go to gain their release? Starring are Dermot Mulroney and Gillian Anderson, who’s returning to series TV for the first time since The X-Files. American Dream Builders (reality) -- Nate Berkus hosts a competition among designers, builders, architects and landscapers. Their challenges are “extreme home renovations.” Hasn’t this already been done before? Two more new dramas -- Chicago PD, The Night Shift -- a comedy (Undateable and a pair of reality series (Food Fighters, The Million Second Quiz) have been ordered by NBC but don’t have homes yet in either the fall or midseason.